Im looking to purchase a California Kingsnake for the first time and I was looking for some tips on things like enclosure/terrarium size, what Id need to put in it, tenperature, thing like that. Any and all help is appreciated. Thank you! An adult California kingsnake will do fine in at least a 20-gallon enclosure. Be sure to include some hiding places the critter can fit into and provide a warm spot of around 85 degrees Fahrenheit. The cooler side can be in the 70 degree F range. In order to keep track of the temps, two thermostats, one on each end of the cage, are crucial. No special lighting is required, but try not to place the cage too close to a window, or the sunlight that may shine on it may prove fatal for the snake. Oh, and by the way, hot rocks won't make a good heat source. Prolonged contact may cause serious burns. Instead, you could use an undertank heater. Some substrates to avoid using for a California kingsnake include cedar shavings, pine shavings, and cat litter. More preferable choices include aspen shavings and newspaper, though take a bit of caution when using substrate the snake can ingest. Also be sure to find a decent sized water bowl that the snake can soak itself in. Clean it whenever necessary and keep track of how the water is affecting the humidity of the cage (with a hygrometer, of course). One more thing: be sure to allow the snake to settle in for a while before you begin handling it. That's it for now. Feel free to let us know if you have any questions. What Clockwerk told you is certainly one way to keep a kingsnake, if you look in caresheets form keepers / breeders especially from the US you will find information close to what he describes. So keeping a Californian Kingsnake this way works and it will probably live for many years in it. However, whenever I see a setup like this, I think it’s boring to plain ugly. There are alternatives how you can keep your snake, and they are not only nicer to look at but also beneficial for your snake. I don’t keep kingsnakes any longer, I still have an old pueblo milksnake (I think he is currently 21 years old), but I had a male and a female Californian Kingsnake for quite some time. The male was 23 when he died, the female probably 21. Both were probably 2 years old when I got them. The way I kept them then is totally outdated today, we have a much better technology today. If I had one today I would keep it similar to how I keep my Aesculapian snakes (Zamenis longissimus). 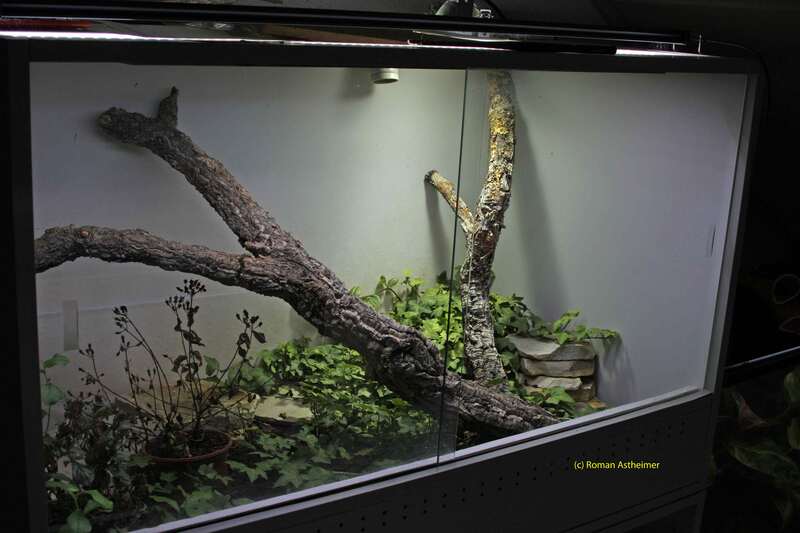 I kept my Lampropeltis in an enclosure 120 x 60 x 60 cm (4 x 2 x 2 ft), a small snake could be kept in a slightly smaller one like 100 x 50 x 50 cm. I use the same size for a pair of my aesculapians. For ambient lighting I use a near full spectrum LED light (5500 K) which covers the full length of the enclosure and a 50 W Metall halide light which also emits UVB. This light is placed over one side of the enclosure, creating a bright basking spot. It is the only source for heat I use, nothing else is needed and I don’t need a thermostat as well. The MH light creates a hot spot right below the light of ca 35 degrees C (95 F) and a thermal gradient to the opposite side of the enclosure where the temperature is room temperature. So the snake can choose to bask directly under the hot spot to get to it’s preferred temperature or stay in a cooler area. The enclosure is big enough to create zones of different temperatures and different intensities of light and UV levels. For substrate I generally use “ReptiBark”, that’s chips of fir bark. It works great for any kind of snakes, I use it for pretty much everything from dry enclosures to rainforest. Use a layer deep enough so your snake can burrow in it (at least 1 In, better 2 In). Add some plants, some branches, some pieces of cork bark and flat stones as hiding places and additional cover, snakes don’t like open spaces, so make sure you cover most of your ground with something.